A good understanding of pathology will turn a competent veterinary nurse into an outstanding one. Harriet Brooks. 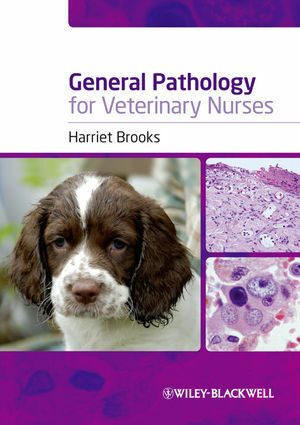 This is one of the first books on general pathology designed specifically for veterinary nurses and veterinary nursing students. Pathology underpins all you do as a veterinary nurse. Knowledge of the general pathological processes will give you a deeper understanding of every aspect of an animal’s health. Building on your prior knowledge of anatomy, physiology and biochemistry, the book explains the pathological changes that occur in sick animals. It describes the various disease processes and shows you how to relate them to clinical presentation, diagnosis and prognosis, and treatment rationales. This book will give you the knowledge and confidence to develop your role within the veterinary team. 1 Introduction to Veterinary Pathology. Pathology as an academic subject. Lesions – structural and functional changes. Definitions of cell response or injury followingharmful stimulus. 5 Pathology and the Immune System. Definition of tissue repair or healing. Tissue repair – general and specific examples. What can impair, prevent or alter healing? How does interstitial fluid gather in the tissues? Impaired blood supply to tissues. 8 Disorders of Cell/Tissue Growth. Atrophy, hypertrophy, hyperplasia and metaplasia. Answers to Test Yourself Questions. Includes many linedrawings to aid comprehension, question and answer sections to test understanding and text boxes of key information.